Granite offers the designer theopportunity to blend the marvelous variations found in nature, the basic rhythm of the earth exhibiting a wide range of amazing colors, with a practical need for high performance in areas that are subject to high use.Granite is the only stone that is acceptable for use as a kitchen countertop. Since granite is formed in nature there are no two applications that are the same, each installation is unique. Every individual slab you inspect will exhibit differences even if the slabs were cut from the same block. Even though the granite is given names, the names are just an indicator of the color, texture and veining , never an absolute. It is these natural differences that make granite unique, valuable and highly desirable. Granite is an intrusive (within the Earth’s crust) igneous rock; the formation occurs by magma flowing into pockets deep beneath the Earth’s surface and over millions of years cools and crystallizes. In some cases the stone could also go through a metamorphic change (exposure to high pressure and temperatures of a long period of time) resulting in a transformation of the crystalline structure. There are basically 25 minerals that can be found in granite each contributing to the color and physical make up of the stone. The four mineral families most commonly found are quartz, feldspar, mica and hornblende. 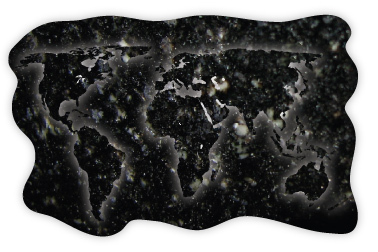 Granite is found all around the world. The more colorful and therefore more in demand for decorative applications are found in Africa, Brazil, China, Italy and India. Other exporters of granite are Argentina, Egypt, Finland, Iran, Norway, Sardinia, Spain and the Ukraine. Granite is found in abundance in the United States but the colors are more compatible with monument and exterior works. Granite is mined at huge quarries. The basic process is to use dynamite charges to dislodge large blocks from the mountain. The blocks are roughly 6’X6’X10’ and weigh up to nearly 4 tons. The block is moved on to a large gang saw where it is cut into slices or slabs generally 2 cm or 3 cm in thickness. Other thicknesses are available but 2 cm and 3 cm represent the “standard” thicknesses for countertops. The slabs are then sent through a seven stage polishing procedure to achieve the desired high gloss surface finish. High pressure is used in each of the seven stages of polishing. The polishing process will often dislodge softer minerals that are in the granite surface. The extent to which this pitting occurs is dependent upon the physical makeup of the granite. Granite minerals have a Moh’s scale hardness rating of 6 to 7 (Diamond is the hardest with a Moh’s hardness of 10). Biotite, a member of the mica family and frequently found in granite, has a Moh’s hardness of 2.5 to 4.5 and consequently does not polish well and will appear as small rough spots on the surface. The hardness of the biotite makes little difference in most applications, as the overwhelmingly dominant feldspar and quartz minerals are much harder. The biotite may “pluck” slightly when polishing but not in general use. Another naturally occurring phenomenon are fissures. Fissures are often confused with cracks as they appear on the surface of the granite. Fissures were created when the stone was first formed. There is a difference between a crack and a fissure. Fissures are naturally occurring and represent no issue in the performance of the stone. The only fissures that should appear on a grade A stone are found just on the surface. A mechanical force due to fabrication, installation or other circumstances at the jobsite causes a crack. The cracks caused by a mechanical force generally transmit entirely through the slab so it would appear on the top, edges and bottom of the slab. The most frequent cause of cracks in granite countertops is a tradesman who uses the granite countertop as a step stool. There are definite weak areas for granite countertops. These areas are around the sink and cook top cutouts and any overhang beyond the cabinet base. A high quality fabricator will place steel reinforcing rods around the cutouts to add strength to these vulnerable areas. Cracks will be visible on the top and bottom surfaces of the stone. A skilled granite craftsman can repair some cracks in the field. Once the slabs have been polished the surfaces are then sealed. The sealant adds an oliophobic and hydrophobic barrier on the surface of the granite that causes oils and water to bead. At this point the slabs are ready for shipment. A stone distributor who warehouses the stones and readies them for final shipment to a fabricator/installer generally handles shipment from the quarry. The stone distributor and fabricator work together to assure that the end customer has the proper selection of stones available to meet their needs. Frequently, a fabricator/installer will make arrangements for a customer to view slabs at the distributor’s warehouse since the selection is usually greater. SS Construction Specialists Inc has a working relationship with all of the major distributors in the Georgia area. Weight: between 16.7 and 19.8 pounds per square foot at 1.25 inches thick (3cm). It is possible for some finished pieces to weigh in excess of 800 lbs. When the weight is too high we often add an additional crew to the installation to assist with putting the stone in place. 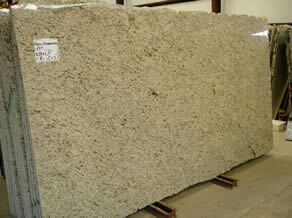 Slab dimensions: Generally up to 78 inches in height and 110 inches in width. It is often necessary to seam pieces since the dimensions of the slab limit the length of an individual piece. Other stones sold as granite having a similar physical makeup: anorthosite, basalt, diabase, diorite, gabbro and gneiss. There are many questions regarding the potential for bacteria growth on granite since it is a porous material. Bacteria requires several things in order to thrive and grow: oxygen, water, sunlight, nutrients, and a substrate to form on. The minerals in granite are toxic to bacteria. As a result, there is no habitable environment for the bacteria to live and grow on a granite surface.